This Component Kit is designed for the 1st edition of Charles Platt's Make Electronics book and is not compatble with the 2nd edition released in 2015. ProTechTrader Exclusive: Make: Electronics Component Pack 1 - 2nd Edition available now direct from our website and where ProTechTrader products are sold. 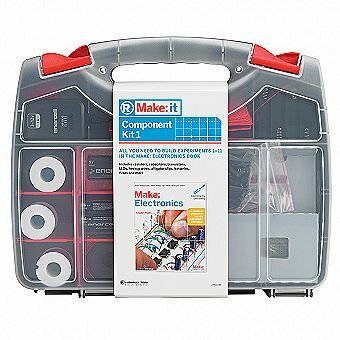 The Make: It Component Kit 1 is the first companion pack to the popular Make: Electronics book. It includes all of the components necessary to complete the experiments from the first two sections of the book (experiments 1-11). We've spent hours sourcing these hard-to-find parts, so you don't have to waste time gathering parts and can get right to building circuits. All parts are spec'd directly from the book and author Charles Platt to ensure compatibility. Most of the parts included are reused throughout the book and can be re-purposed for use in future projects. With over 250 components, organized in a rugged tackle-style box, you'll be ready to start working on the projects as soon as you crack open this unique, hands-on book. Build the circuits first, then learn the theory behind them. With Make: Electronics, you'll learn all of the basic components and important principles through a series of "learn by discovery" experiments. And, you don't need to know a thing about electricity to get started.